As the largest walled garden in England, Croome Court embraces many of the fundamental elements of market gardening. 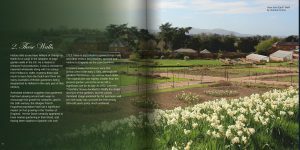 Designed to feed the occupants of what is commonly described as ‘a stately home’, the gardens were, in their heyday, nothing if not busy and full of vitality. It’s easy to imagine the steady rhythm of the growing cycle; sowing, nurturing, ripening, and harvest; bringing a sense of calm and permanence to the occupants of the big house. Yet nothing could be further from the truth. The history of Croome is far more unsettled than the sedate beauty that greets you today. Imagine a brisk February morning in 1840; all five furnaces that support the Hot Wall, and two further furnaces pumping hot water to the glasshouses are all in use. Viewed from the Earl’s Walk, the sight before you would be one of industrial revolution smoke stacks belching their black dusty billows that the garden might be awakened early from its winter torpor. Summon an east wind and the big house would have been largely obscured by the smoke clouds passing over it. Pictures such as these underscore a key point: that the Walled Garden was foremost a factory of food, and not a rural retreat. The chronology of this restoration story unfolds naturally; after all, you cannot attempt to restore glasshouses before you have rescued the paths that access them. From the outset, the entire project has been driven by the Cronins, two distinctly different individuals each in possession of a unique set of skills and robust character – fortunate, since seventy years of unbridled wildlife can create many a challenge, as Karen Cronin recalls: “We had actually been looking for something to simplify our lives: a nice self-contained home and garden. Midway through our adult lives we were in a lucky enough position to get what we wanted without having to take out a mortgage. We went to a house auction where nothing much fitted our bill and afterwards it was suggested we might go and have a look at this place on the Croome Estate. It was attractive to us in that we knew the area well through a mutual friend who had lived on the boundaries of the estate for many years. Besides, we had both grown up fairly close by and loved the area. The large stone arch, the so-called ‘London Gate’ that gives access to the estate, was as familiar to us as signposts for the M5 – but we’d never been in. What greeted us when we turned up almost defies description: the broken hulks of enormous glasshouses sat forlorn like shipwrecks in an ocean of brambles. As I stood there trying to take it all in I heard my husband say, “We’ll take it”.